Helmut Moldners Shihan- Courtesy of Eugene Kitney Sensei. Helmut Moldners Shihan commenced training in Sydney Australia, in the Art of Judo in approximately 1961, as a 12 year old adolescent. After a number of years he was introduced in 1964 by his friend Paul Starling to the Goju Kai School of Sensei Merv Oakley , a branch of Gogen Yamaguchi Kaiso at the age of 15years. After training at Sydney Goju Kan Dojo with Paul Starling Shinan he moved to Melbourne to become a full time Instructor during the latter months of 1972 with the Melbourne Goju Kai, and Tino Ceberano Shihan. After 5 years of full time teaching in Melbourne he married and then transferred to the North Coastal Region of New South Wales near to the border of Queensland, in Grafton, where he opened his own Branch of North Coast Goju Kai Karate do in 1977 which is still expanding today under the leadership of his senior students Anne Trimble, Rick Burton, Nathan Perry, Peter Roberts? and David Hanson. Helmut Shihan has trained in Japan on two occasions, and some of his senior members (who respect him deeply) have also taken the opportunity to travel to the Goju Kai honbu in Japan for advanced training with Yamaguchi Goshi Shihan, and on other occasions to compete in World Goju Kai IKGA tournaments. Long time students of Helmut Shihan, such as Anne Geary [Trimble] 4th Dan, & Paul MacLeod, 3rd Dan, have represented Australia as national team members for the Federation of Australian Karatedo Organisations, now AKF , and have both been State and National tournament champions.Helmut Shihan's training methodology however is not aimed at tournament training, but rather the emphasis is on traditional methods of close quarter goju ryu training. 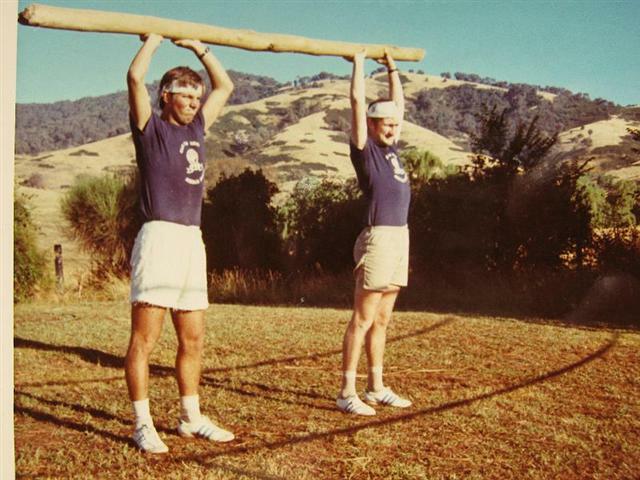 at Tallangatta , both then aged about 22-23 in 1972 circa. As a graduate from Macquarie University, in behavioural Sciences, Helmut Shihan has a deep and abiding religious belief and at all tiimes intended to instil a sense of just moral value within his student body in Grafton and Coffs Harbour. Retiring from full time teaching recently after the passing of both parents, Helmut Shihan will celebrate his 60th birthday in April 2009 and a large celebration is in order in Grafton with our Grandmaster, Goshi Yamaguchi Hanshi also attending due to the Australian IKGA Goju Kai Seminar to be held on the North Coast (April 2009). 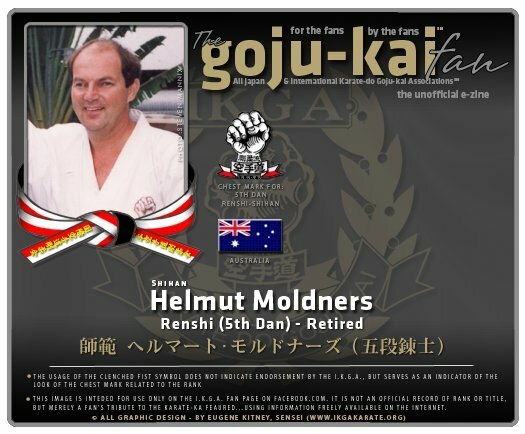 Helmut Moldners Shihan has been a dedicated and caring role model to his large student membership body throughout the 32 years that he has taught for Goju Kai on the Far North Coast of New South Wales and has left a legacy of serious students who are continuing his methods and incorporating the IKGA syllabus throughout their Dojo. As both an early student and dear friend of Paul Starling Shihan since early childhood, (they grew up together in Hornsby in Sydney); Helmut Shihan was also instrumental in building up the Macquarie University Karate Club Dojo 40 years ago with Paul (in the late 1960's ) Staying out of the political ramifications regarding Karate federations and bodies , Helmut Shihan stressed his spiritual existance, at one with God, and spends much of his time deep in prayer for the benefit of humanity (almost Monk like in nature) whereby he lives in solitude on an isolated property. surrounded by kangaroos, koalas and typical aussie wildlife. Still advising and mentoring senior students eg: Steve Mannix Sensei who runs the Tugin Dojo on the Gold Coast of Queensland, travels on a regular basis to Hemut Shihan's home. In this way he is still contributing in a very meaningful way to the students who have assumed leadership of his flourishing School.